I don’t think I’ve managed to land a single plane in Microsoft Flight Simulator X. I’m better off sitting in the passenger compartment, guzzling down tiny bottles of whisky and peering at the tiny screen attached to the chair in front. 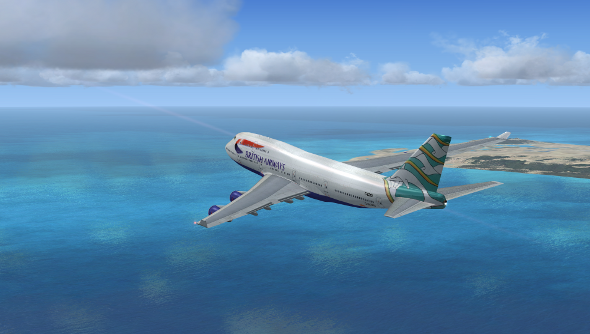 A new flight sim is on its way, but I suspect I won’t have any better luck with landings. Dovetail Games, the creators of Train Simulator and the upcoming Dovetail Games Fishing, today announced a deal with Microsoft. The studio has been granted the rights to develop new flight sims based on Microsoft’s tech, along with distribution rights for Microsoft Flight Simulator X. Want more Flight Sim X? Here are the best Flight Sim X add ons. Flight Simulator X has been around since 2006, expanded in the Gold Edition, but isn’t available on Steam. This distribution deal changes that, allowing Dovetail Games to bring the Gold Edition to the platform in the form of Microsoft Flight Simulator X: Steam Edition. Microsoft executive producer Kevin Perry called Dovetail Games “the obvious choice” for a partnership. Microsoft Flight Simulator X: Steam Edition is due out late this year, while the new title Dovetail is developing won’t be out until next year. The project is still in its infancy, with the developer exploring new concepts.